Researchers at the Ghent University Center for Molecular Modeling in Belgium have discovered through computer simulations that the temperature at which metal-organic frameworks expand or shrink can be tuned, which makes it possible to use them in thermostats that work at the molecular level. 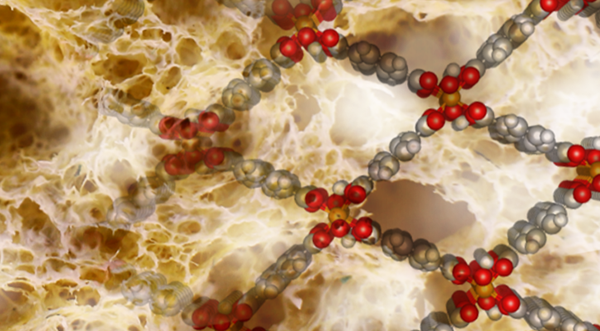 The specific metal-organic frameworks that Ghent researchers studied have pores that open or close when heated or cooled. This causes a sudden increase or decrease in volume. Researchers determined that the temperature at which this occurs depends on the make-up of the framework. This study gives scientists new ideas for creating thermostats from a handful of molecules, which could be helpful as the miniaturization of electronics continues. “Temperature-responsive flexibility in metal-organic frameworks (MOFs) appeals to the imagination. The ability to transform upon thermal stimuli while retaining a given crystalline topology is desired for specialized sensors and actuators. However, rational design of such shape-memory nanopores is hampered by a lack of knowledge on the nanoscopic interactions governing the observed behavior. “Using the prototypical MIL-53(Al) as a starting point, we show that the phase transformation between a narrow-pore and large-pore phase is determined by a delicate balance between dispersion stabilization at low temperatures and entropic effects at higher ones.